Title: All we need is IMPACT? Summary: Gyakuten Saiban 4 (Apollo Justice: Ace Attorney)'s planner Yamazaki, who would later become the main director of the Gyakuten Saiban (Ace Attorney) and Gyakuten Kenji (Ace Attorney Investigations) games, writes about some scrapped ideas for Gyakuten Saiban 4. 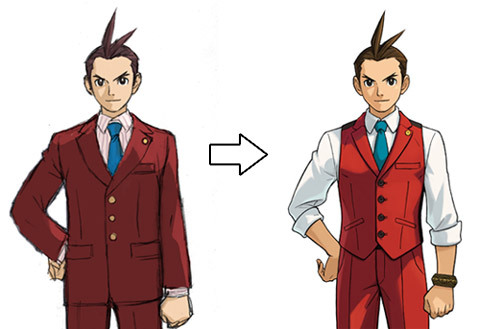 1) Doing the witnesses in 3D 2) A scrapped idea for an animation of the protagonist Odoroki (Apollo Justice. 3) A scrapped idea for Minuki (Trucy), heroine of the story. Some of these ideas are actually reused in later games. We also get a glimpse of director Endō drawing skills. The post was originally posted on April 10, 2007. Images are taken from the source article. Copyrights belong to their respective owners. All we need is IMPACT? Hello. Planner Yamazaki here of the Gyakuten Saiban team. We’re finally close to the release day. 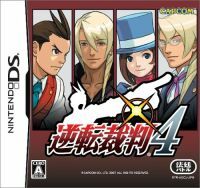 There’s a sort of tense ambiance around the Gyakuten Saiban team now.We all feel very conflicted inside us: both excited and afraid thinking that in just a few days, you all will be playing Gyakuten Saiban 4 (Apollo Justice: Ace Attorney). We just can’t geto to work. For this blog post, I dug up some “rejected ideas” from the documents I’m organizing now. At the very, very bottom of the pile of development documents, in the deepest depths, lies Gyakuten Saiban 4’s “original proposal” at rest. There was not even a hint of Odoroki (Apollo Justice) back then, and we were still looking into all the possibilities of Gyakuten Saiban 4. …That wasn’t the actual name, but it was an idea to have the witnesses in 3D (there was another reason for 3D besides impact, but that has to do with the contents of the game, so I can’t write about that. As the meeting went on, our dreams took on some wild forms. But for various reasons, the 3D idea was not used. 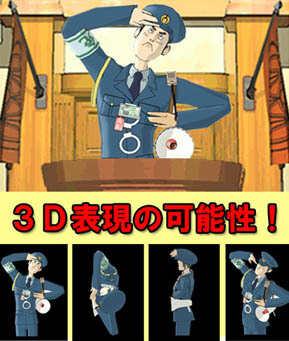 In Gyakuten Saiban 4, we went even further with the 2D presentation that has developed throughout the series until now. The final game really uses all the Nintendo DS has to offer in terms of presentation, and it is an evolved 2D presentation, with a lot of impact. On the other hand, we did use “the potential of 3D” in a “different form” in the game. Presentation that is only possible in 3D… I can’t write about that in detail here, so please check it out for yourself in the game. I have a list here I dug up from the pile of documents. It’s a list of ideas for possible animations for our new protagonist, Odoroki Hōsuke (Apollo Justice). How does he look when talking? How do we show his personality through his animations? It’s a list both planners and designers thought hard about. I too thought hard about this when development started. Thinking about an animation that could portray Odoroki’s personality, and which had impact. There was a very special reason that connected Odoroki with “rolling up one’s sleeves”. In the final stages of Odoroki’s design, Mr. Takumi suddenly said: ‘Let’s roll his sleeves up’. When we tried that out…it looked really nice on Odoroki. At that moment, the image of Odoroki just before he rolled up his sleeves appeared in my mind. The sleeves of his shirt hanging loosely… That didn’t fit him at all. And because he’s always rolling them up made them all wrinkled up! This definitely looked bad. So that’s why that idea was rejected. A design of him with his sleeves rolled up, and the animation of him rolling up his sleeves, are different I guess. Coming up with animations isn’t as easy as you’d think…. Birth of the New Heroine? I want to show you one last document I dug up from the development files. This happened during the meeting about our new heroine, Minuki (Trucy). 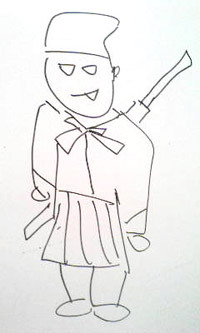 This is the Minuki Mr. Endō slowly started to draw. That is it for this time. Next time is Mr. Takumi you have all been waiting for. Look forward to it!